Welcome to the seventh edition of the heinnews.com Photo Caption Contest!!! This is your chance to win prizes. Just take a look at the picture and write a caption. If the bosses at heinnews.com like your caption the best, then you win. So, give it a go. Come up with something good. You have until Feb 1, 2009 at 8 pm CET. Need a bit of inspiration, click on previous Photo Caption Contests. Feel free to tell your family, friends, colleagues, teammates, what have you about the contest. The more fun the merrier. All entries will be published. Send your entries to heinnews@gmx.de or post them below. ATLAS – Saving the world at last!! Okay, two out of three and I sign the bill. Mr. President! Just treat the globe as gentle as the ball! Welcome to the REAL inauguration ball! OK guys…. if I make this one I get to keep my Blackberry. After 15 years, the basketball fashion of baggy shorts is supplanted by dress pants and a tie. 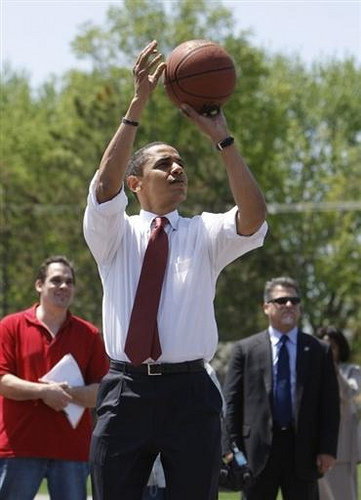 Game-Winning 3 by Obama! Final Score: Presidents 79, Purple Raiders 77!